Blogsheet information entry to the blog as group (blogG) will be reduced. You will only require to put short sentences as comments. The blogsheet will still be due Monday. The points for this part will be reduced to 10 points from 20 points. Blog related post-quiz questions (10 points) will be individually submitted (blogI) along with detailed blogsheet information submission (10 points) that are typed in red text in the blogsheet. This assignment will be due Wednesday the following week. Commenting and responding to comments will be due the following Wednesday. Measure the resistance of the speaker. Compare this value with the value you would find online. Figure 1: Test setup for the speaker. Fill the following table. Discuss your results. 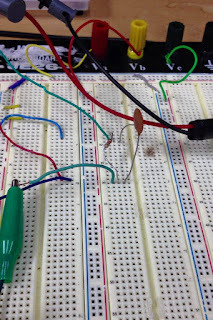 Add one resistor to the circuit in series with the speaker (first 47 Ω, then 820 Ω). Measure the voltage across the speaker. Briefly explain your observations. With the resistor added to the circuit in series with the speaker we were able to observe the circuit. With the frequency low the sound was more of a low pitch and as we increased our frequency the pitch began to rise and get louder. Build the following circuit. Add a resistor in series to the speaker to have an equivalent resistance of 100 Ω. Note that this circuit is a high pass filter. 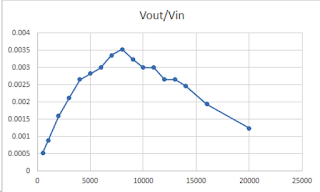 Set the amplitude of the input signal to 8 V. Change the frequency from low to high to observe the speaker sound. You should not hear anything at the beginning and start hearing the sound after a certain frequency. Use 22 nF for the capacitor. Figure 2: Test setup for the high pass filter. 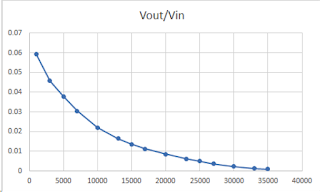 Looking at our graph from excel it is shown that the cutoff frequency of our filter is around 8000 Hz. 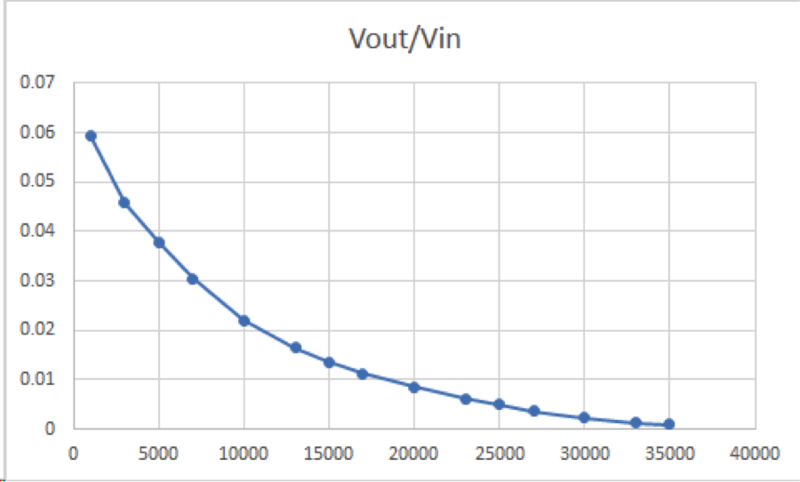 Output = [ ]; % Vout/Vin data points would be in the brackets. Calculate the cut off frequency theoretically and compare with one that was found in c.
Explain how the circuit works as a high pass filter. 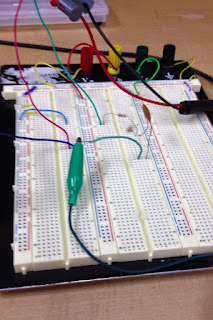 Design the circuit in 4 to act as a low pass filter and show its operation. Where would you put the speaker? Repeat 4a-g using the new designed circuit (e, f, and g are for blogI). For creating the low pass filter the speaker will end up in parallel with the capacitor in order to have the low pass filter properties. 1. 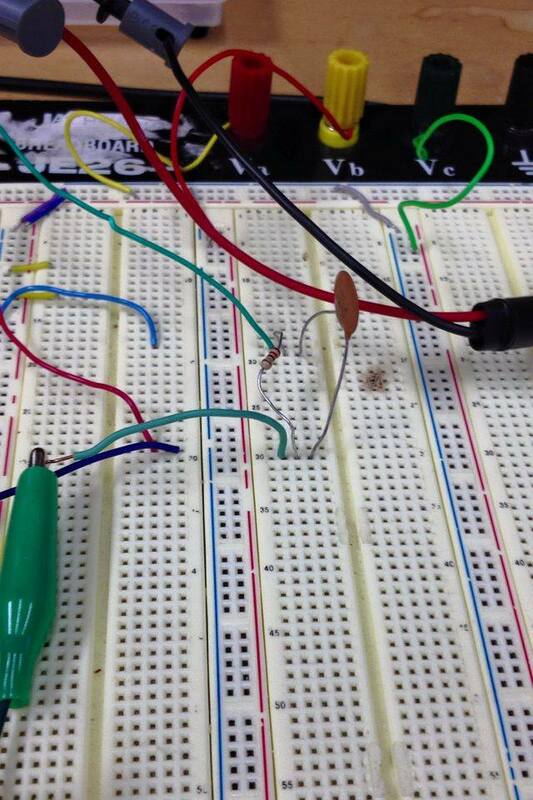 Construct the following circuit and test the speaker with headsets. Connect the amplifier output directly to the headphone jack (without the potentiometer). Load is the headphone jack in the schematic. “Speculate” the operation of the circuit with a video. With the circuit set up with an amplifier it was possible to put audio into the microphone and with our headphones hooked up we could somewhat hear the music. The music did not come through very clear but it was possible to hear the song. the operation of the circuit with a video. I noticed that your low pass graph didn't show any dramatic changes in shape. What was different about your data points from high pass to low pass? Good work otherwise. 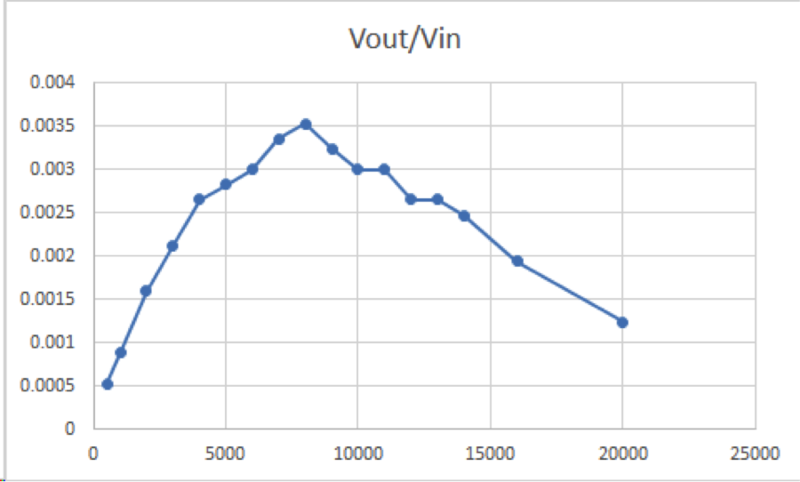 Why do you think Vout began to drop after about 8 kHz for the high pass filter, rather than staying consistent? I am puzzled with this data as well.